Country of Origin: The Alaskan Husky is not a specific breed, but a general term describing any mixed breed dog that gives the appearance of a Northern sled dog. Typically, it is some mix of the Siberian Husky with a Doberman, or with a hound such as a foxhound or greyhound. Some Alaskan Huskies show a clear wolf ancestry. The Alaskan Husky began attracting attention with the Alaskan Gold Rush in the late 1800’s. Large, strong sled dogs were needed for transporting people and goods over great distances. The typical Alaskan Husky of that time was a heavy dog composed of a Saint Bernard mix. When Siberian Huskies were first imported into Alaska in 1908, they immediately dominated sled racing events. These smaller, lighter, faster breeds would dominate racing events from that day forward. 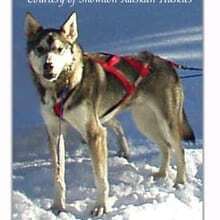 Sled dogs became less prevalent with the advent of motorized vehicles in the first half of the twentieth century, but in the 1970’s, a native Alaskan named George Attla successfully bred a number of Alaskan Huskies, helping to revitalize the breed. Today, the Alaskan Husky remains the fastest sled dog over short distances. Champion Alaskan Husky racers are valued at amounts upwards of $10,000. Size: Due to the variety of potential mixes, the Alaskan Husky can come in many shapes and sizes. The majority weigh 17-27 kg (38-60 lbs). Most Alaskan Huskies are similar in appearance to the Siberian Husky, but taller with a more noticeable tuck-up (stomach tucked up behind the chest). Alaskan Huskies should have a round skull, almond-shaped eyes and triangular, erect, furry ears. Alaskan Huskies have an arched neck, furry, sickle-curved tail, and furry, oval feet. Coat: The Alaskan Husky should have a short or medium length coat which is less dense than most Northern breeds for effective heat dissipation when racing. It is built for quick speed rather than endurance over long distances, and may require a coat or ‘dog boots’ when on the trail. The Alaskan Husky may be of any color and pattern; coat color is generally of little significance to sled racers. There are a variety of interesting facial masks and markings and many possible mixes of eye color. Character: The Alaskan Husky is eager, energetic, and loyal to family. It is playful and easy-going; some are sociable while others are somewhat shy. Many Alaskan Huskies tend to be loud, especially when in groups of more than one. They are skilled at digging under or leaping over backyard fences, so proper precautions should be taken. The Alaskan Husky can be hyperactive indoors and will grow bored and destructive if not sufficiently exercised. Temperament: The Alaskan Husky does not naturally get along with other pets, but may tolerate them if socialized from a young age. It enjoys the companionship of other Alaskan Huskies. Care: The Alaskan Husky requires weekly brushing with a metal comb, more often when shedding. The Alaskan Husky is generally healthy; some are prone to PRA (an eye disorder) or hypothyroidism. The Alaskan Husky has a lifespan of 10 to 15 years. Some racing lines are bred for early maturity and begin to deteriorate as young as six years of age. Training: The Alaskan Husky can be stubborn and will take advantage of its owner when possible. This breed requires patient, consistent training. Activity: The Alaskan Husky Needs a substantial amount of exercise, but it should not be over-exercised in warm weather. This is not a good breed for those unprepared to meet its high exercise requirements, and it is not well suited to apartment life.